Filing of income tax is an important procedure for the taxpayers. Many people think that they are free from the responsibility after filing the income tax returns. The process of filing is incomplete without e-verification of your tax return. A return is not valid until it is verified as filed by the taxpayer. The Income Tax department starts processing your return only when it is verified. There are many ways to verify your ITRs. The returns can be verified manually as well as electronically. For the persons, who do not want to e-verify their returns can send the hard copy of ITR-V to CPC, Bengaluru. How to e-Verify Income Tax Returns (ITR) in India? What is Income Tax Return and the last date of filing tax returns? You can skip this section if you are already familiar with it. An Income Tax Return is a statement that contains all the information regarding income of a taxpayer and tax thereon to be filed with the income tax authority. It is to be filled in a prescribed format and you need to fill respective ITR form. Different forms are available for individuals, firms, HUFs, companies, trusts, etc. from ITR-1 to ITR-7. One needs to choose a correct form as per the income tax law and furnish all the information required on those forms. The due date of filing income tax returns for individuals and non-auditable firms is 31st July. However, for the financial year 2017-18 (assessment year 2018-19), this date has been extended to 31th August. For companies, auditable firms, trusts etc the last date to file their income tax returns is 30th September. The CBDT has also issued a notice that non-filing of ITR before the due date of this assessment year would attract a penalty of Rs. 1,000 Rs. 5,000, and Rs. 10,000 depending upon the case. The income tax department has given many ways to e-verify your income tax return. The following are some of the simple ways to e-verify ITR. #1 – How to do e-verification of ITR through net banking? Log in to the Net Banking Account. Clink on the link “e-filing”. On clicking it, you will be guided to the e – filing portal. Once you are there, click on e-verify ITR and you would get a message that it is successful. Your IT return is verified. If you have an ICICI Bank account, simply login –> Go to Payments and Transfers –> Go to Manage your taxes –> Select Income Tax e-Filing and it would direct you to an Income tax website and click on e-verify and you would message that your e verification is complete. If you have an HDFC Bank account, simply login to that and follow Requests –> Income Tax efiling –> Select your account –> Confirm —> It would be directed to an income tax website and then click “e-Verify” and you would get confirmation message. Click on that and you are done. 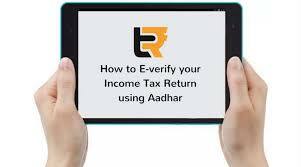 #2 – How to do e-verification of ITR through Aadhar Card? If one wishes to verify his ITR through Aadhar card, then his Aadhar card must be linked with his mobile number. Log in to e-filing portal. Please make sure that your Aadhar Card is linked with your Pan number. Go to e-Verify return option under the “My Account” tab. Under this option, a taxpayer will be shown with three options. Click on the third option which says, ‘to verify your returns using Aadhar OTP’. Click on to this option. An OTP (one-time password) is created and sent to your registered mobile number. It is important to note that Aadhar OTP is valid only for 30 minutes. Enter the OTP in the text box provided and click on submit. As next page is displayed, your ITR is verified. #3 – How to do e-verification of ITR through Income Tax e-filing Website? Log in to the website of Income tax department www.incometaxindiaefiling.gov.in with your credentials. When you click on e-verify, there is a list of modes through which you can generate EVC (Electronic Verification code). You can select any of the given modes to generate EVC. Enter the EVC and submit. A confirmation message will be displayed on the screen along with the transaction ID and EVC code. This is for your record only. No further actions required. #4 – How to do e-verification of ITR through Bank ATM? You will receive an EVC (Electronic Verification Code) on the registered mobile number. Now log in to the e-filing portal. Choose verification mode as “Already generated EVC through Bank ATM. #5 – How to do e-verification of ITR through DEMAT Account? Go to “profile setting” and pre-validate your DEMAT account. As EVC will be generated and sent to registered mobile number. Also Read: Credit Access Grameen IPO opens on 8th August – Should you invest? What if that you are not successful with any of the above electronic methods? If you are not able to process your everification through any of the above electronic methods, you can still go ahead with manual method. Here is the process of manual ITR verification. Send the document by speed post or normal post to CPC Bangalore address. You cannot send it by courier. This one page document to be sent to Income Tax Department, Post Bag No.1, Electronic City Post Office, Bengaluru, Karnataka 560100. You should send the one pager document within 120 days (4 months) after the ITR is filed. Once the ITR is processed by IT department, you would get an acknowledgement SMS on your registered mobile. This is probably the best, most concise guide I have ever seen on Income Tax Return Status. Very Useful and Informative guide. Being CA by profession, I have seen people after filing ITR, they altogether forget about checking the status online. I am looking forward to reading articles from now on. Thank you Yogesh. How you did your everification of income tax returns?